Fritzens, Austria – The U.S. continued to showcase strong form on Saturday at CDI4* Fritzens with riders securing three of the top five placings in Big Tour competition. Steffen Peters, Tina Konyot, and Adrienne Lyle, all members of the Short List for the 2014 Alltech FEI World Equestrian Games U.S. Dressage Team and London Olympic Games veterans, helped the U.S. to monopolize the top placings in the Grand Prix for the Freestyle. Earlier in the day Peters earned his second Small Tour victory of the weekend. Peters (San Diego, Calif.) and Four Winds Farm’s Legolas 92 demonstrated the form that has helped them earn three National Titles as they scored 75.340% on Saturday. The 12-year-old Westphalian gelding finished in second place, 8/10s of a point behind the day’s winner. Earning a third-place finish in the Grand Prix for the Special was Konyot (Palm City, Fla.) and her veteran 16-year-old Danish Warmblood stallion Calecto V on a score of 72.600%. Rounding out the U.S. effort on Saturday was Lyle (Ketchum, Idaho) and Peggy Thomas’ 15-year-old Oldenburg gelding, Wizard, who finished in fifth place on a score of 68.640%. Austria’s Victoria Max-Theurer collected her second victory of the weekend, winning Saturday’s class on a score of 76.180% with Augustin OLD. To start the day Peters and Konyot both represented the U.S. in Small Tour competition performing the Intermediaire I Test. Peters and Four Winds Farm’s seven-year-old Rheinlander mare Rosamunde earned their second victory of the week after scoring 76.026%. Konyot and Bruce Grivetti’s 13-year-old Hanoverian gelding Wyoming finished in 18th place on a score of 64.605%. Competition at CDI4* Fritzens comes to a close on Sunday with Peters, Konyot, and Lyle riding in the Grand Prix Freestyle. Laura Graves (Geneva, Fla.), Shelly Francis (Loxahatchee, Fla.), Caroline Roffman (Wellington, Fla.) and Lisa Wilcox (Loxahatchee, Fla) will perform the Grand Prix Special. Learn more about the CDI4* Fritzens here. Lyon, France – The 2014 Reem Acra FEI World Cup Dressage Final came to an exciting conclusion Sunday afternoon at the Lyon Eurexpo, as 17 of the world’s best performed their Freestyles in front of the Ground Jury of Eduard de Wolff van Westerrode, Dr. Jean-Michel Roudier, Thomas Lang, Dr. Evi Eisenhardt, Gary Rockwell, Jacques van Daele, and Leif Tornblad. The two American riders, Tina Konyot and Cesar Parra, both posted improved scores over their Grand Prix results to close out their trip to the FEI’s only annual championship. Entering the ring as the fifth combination of the day, Konyot (Palm City, Fla.) and her 16-year-old Danish Warmblood stallion, Calecto V, performed their trademark Freestyle set to the music of KT Tunstall and Beyonce. The 2010 Alltech FEI World Equestrian Games and 2012 Olympic Games veterans began with the strong trot tour they have been become known for; however, three-quarters of the way through her test Konyot forgot her floor plan resulting in a different ending to the test than originally planned. They finished the feature class of the 2014 Final in 12th place on a score of 71.929%. Parra (Whitehouse Station, N.J.) and Michael and Sarah Davis’ Van the Man had an improved performance over their Grand Prix ride to score 68.429% and finish in 16th place. The tension that had plagued the 12-year-old Dutch Warmblood gelding on Friday appeared nowhere in sight as he executed an obedient test set to up-tempo contemporary music. The day undoubtedly belonged to Great Britain’s Charlotte Dujardin and Valegro who had the crowd at the edge of their seats as rode their highly anticipated new Freestyle to earn a mark of 92.179% and claim the 2014 title. With their win in Lyon the pair now stand as reigning World number one, Olympic, European, and World Cup champions. Finishing in second place were 2013 champions Helen Langehanenberg and Damon Hill NRW of Germany with 87.339% and third place went to The Netherlands’ Edward Gal and Glock’s Undercover with a score of 83.696%. To find a full list of orders of go and results from the 2014 FEI World Cup Finals, visit: http://eventcontent.hippoonline.de/890/index.html. Learn more about the 2014 FEI World Cup Finals here. To watch the 2014 FEI World Cup Finals live, visit feitv.org. Follow the U.S. Jumpers here. Lyon, France – The highly anticipated 2014 Reem Acra FEI World Cup Dressage Final got underway Saturday afternoon at the Lyon Eurexpo. As 17 of the world’s best horse-and-rider combinations performed the FEI Grand Prix Test before the Ground Jury of Eduard de Wolff van Westerrode, Dr. Jean-Michel Roudier, Thomas Lang, Dr. Evi Eisenhardt, Gary Rockwell, Jacques van Daele, and Leif Tornblad. The U.S. combinations of Tina Konyot with Calecto V and Cesar Parra on Van the Man produced determined efforts to overcame mistakes in their performances on Friday and look forward to Sunday’s Freestyle. 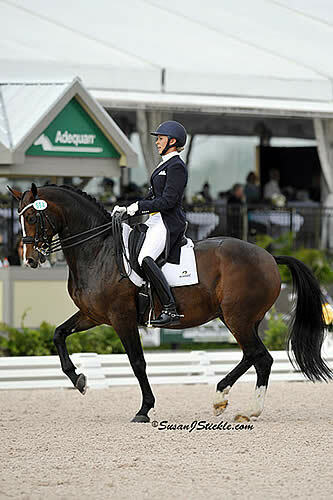 Konyot (Palm City, Fla.) and her 2010 Alltech FEI World Equestrian Games and 2012 London Olympic Games partner once again demonstrated an impressive trot-tour to score 70.443% for their Grand Prix test. However, a few mistakes including in the one-time changes and over-anticipation on final centerline kept the pair from scoring even higher. Additionally, they overcame an unenviable starting position, number one in the order, to finish the day in 11th place. Parra (Whitehouse Station, N.J.) and Michael and Sarah Davis’ Van the Man showed impressive work in their test on Friday but moments of tension kept them from landing higher up the leaderboard as they finished in 16th place with a score of 65.543%. After breaking to the canter in the first extended trot they rebounded with a solid finish to their trot work. However, following the walk tour the 14-year-old Dutch Warmblood gelding became nervous in the corner by M resulting in a disobedience and backing up. Nevertheless, Parra was still pleased with the progress his horse has made in the last year and is excited about competing in Lyon. As expected it was the world first and second ranked combinations battling it out for top honors on Saturday. Collecting second-place honors was the World number two combination and 2013 Reem Acra FEI World Cup Dressage Final champions Germany’s Helen Langehanenberg and Damon Hill NRW on a score of 83.343%. Finishing almost four points ahead of the field, and setting a new World Record as well, were the World’s number one combination and reigning Olympic and European Champions Charlotte Dujardin and Valegro of Great Britain. In their first ever Reem Acra FEI World Cup Dressage Final start they claimed the Grand Prix victory on a score of 87.129%. All eyes will be on Dujardin in Saturday’s Freestyle as she debuts new music and tries to top her current Freestyle World Record of 93.975%. Lexington, Ky. – The United States Equestrian Federation (USEF) will be represented by two combinations at the 2014 Reem Acra FEI World Cup Dressage Final in Lyon, France April 17-21, both having qualified from the North American League. Van the Man is a 2002 Dutch Warmblood gelding. To learn more about The Dutta Corp, visit: http://timdutta.com/. 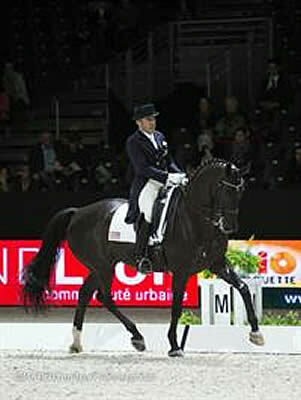 To learn more about the 2014 Reem Acra FEI World Cup Dressage Final, visit: http://www.feiworldcupfinals-lyon.com/homepage. Tina Konyot and Calecto V. Photos © SusanJStickle.com. Wellington, FL – March 28, 2014 – Competition for the AGDF 12 CDI 5* continued on Friday at the Adequan Global Dressage Festival (AGDF) with four major classes. Starting out the day, American Chris Hickey topped the FEI Prix St. Georges, presented by Wellington Equestrian Realty, with Cecelia Stewart’s Ronaldo earlier in the day on Friday. Fellow American Adrienne Lyle finished first with Peggy Thomas’ Wizard in the FEI Grand Prix Special CDI 5*, presented by Diamante Farms, which sponsored all of the large tour classes for the week. Megan Lane (CAN) and Caravella clinched the first place prize in the FEI Grand Prix Freestyle CDI 3* and Tina Konyot (USA) and Calecto V took top prize in Friday’s feature class, the FEI Grand Prix Freestyle CDI 5*. Devon Kane of Diamante Farms was thrilled with Friday evening’s class after watching the AGDF develop from its infancy to the world-class dressage competition it has turned into. Watch the CDI 5* Freestyle winning ride from Tina Konyot and Calecto V.
Allyn Mann of Adequan shared his thoughts on the AGDF circuit as it reaches the halfway point of its final week of competition, reflecting on the 2014 circuit and the incredible growth the show has experienced since its inception three years ago. “As I sit here and I reflect on this journey these last three months, the blessings have abounded big time. I think because of what we have, and what we have seen over these past few weeks, and where the future is going thanks to Mark and what your vision has been, [AGDF has turned into a world-class competition]. It’ll only get better, so we are honored to be in this wonderful position, to support a wonderful sport. It’s a blessing, and we’re very grateful to be a part of it,” Mann expressed. Konyot (USA) received a crystal horse from the Esperanza Collection of Swarovski for her winning ride with Calecto V, her 16-year-old Danish Warmblood stallion out of Bahera by Come Back II. The pair earned an impressive 79.250% to pick up the top prize for the class, while second place finisher Mikala Gundersen scored a 76.775% with My Lady. Third place went to fellow Dane Lars Petersen and Mariett. The pair scored a 76.625% for their performance. Petersen was also awarded the Mary Ann McPhail Award for maintaining the highest international ranking of any rider throughout the twelve weeks of the AGDF. Konyot was happy that Calecto seems to be peaking as he heads into the FEI World Cup Dressage Finals in April and was also especially pleased to earn their highest score yet in the grand prix freestyle. “I’ve always been up in the 70s, but this has been my highest score so far. It’s a very good feeling, especially going into the World Cup, where [the freestyle] is an important score for me, so I’m very happy about that,” Konyot shared. For the weeks leading up to the World Cup, Konyot will continue the same routine with Calecto, always striving to put her partner’s needs first to ensure his happiness and health. “He’s 16 years old; he’s done a WEG, an Olympics. This is not new for him; it’s not new for me either, so we just want to have a great frame of mind, keep ourselves fresh, happy and healthy,” Konyot remarked. Second place finisher Gundersen also enjoyed a personal best on Friday evening after a season of working on the mare’s fitness. “I have the vet check her after each show just to make sure everything is great, and he says, ‘It’s just amazing: this horse gets better and better every time I see her,'” Gundersen smiled. Petersen has used his trademark circus-themed music for his freestyle for the past two years, but tweaked the choreography at the end of the season. He edited the one and two tempi changes, originally performed on a 20 meter circle in the middle of the arena before another line of two tempis. Young professionals ruled in the FEI Grand Prix Freestyle 3*, with Canada’s Megan Lane (22) winning the class with Caravella. The pair scored a 71.600% for the blue ribbon, while 26-year-old Laura Graves (USA) and Verdades took second with a 70.250%. Third place went to Gary Vander Ploeg (CAN) and Degas for their score of 68.350%. Watch Megan Lane and Caravella in their winning Freestyle test. Second place finisher Graves agreed, noting that she and Verdades have developed immensely as a team. “I really feel like our partnership has grown. We’re having a much more adult conversation these days. He plays in the field and we play in the stall and he’s a very goofy horse to be around, but getting in the arena and right away getting to work [has noticeably improved],” Graves explained. Graves admitted that Verdades has always been a challenge, but her hard work and patience have paid off. When she realized their recent scores could qualify her for the WEG selection trials in Gladstone, NJ, she quickly threw together a freestyle for Verdades. “When I realized I might have the scores to get to Gladstone, obviously one of the requirements is to do a freestyle. So I threw this together, and it obviously needs a lot of tweaking, a lot of rewriting of the choreography,” Graves acknowledged. Adrienne Lyle (USA) and Wizard capped off an incredible AGDF season with another victory lap after winning the FEI Grand Prix Special CDI 5*. The pair earned a top score of 75.588% to earn the class by a substantial margin. Second place went to fellow American Michael Barisone, who rode Ellegria to a 69.392%. Cesar Parra completed an All-American top three with Van the Man. The pair earned a score of 69.078% for third place. Watch the winning ride for Adrienne Lyle and Wizard. Friday afternoon’s score was another personal best for the pair; Lyle described their performance as the perfect ending to a stellar season. Lyle admitted she would have loved to ride the FEI Grand Prix Freestyle CDI 5*, but was committed to making her long-term goals a priority. The pair needed to put in some practice in the Special leading up to the Alltech FEI World Equestrian Games (WEG) selection trials in Gladstone, NJ. “I felt less rusty than last time. I chose to do the Special because it is so important for Gladstone and for the WEG qualification. As much as I would have really loved the freestyle tonight, I had to keep our long-term goals in mind, and I’m really glad I did. To have a Special that solid under our belt is really helpful for both of our confidences,” Lyle shared. Barisone was equally thrilled with Ellegria’s performance, remarking that he never have imagined he would have the success he’s experienced with her. “She’s a wonderful horse. She’s honest as the day is long. She’s very simple to ride all the time. I just never thought we would be around 70%,” Barisone expressed. After his two top grand prix mounts were sidelined with injuries right before the 2012 Olympic Games in London, Barisone admitted to getting a bit disheartened, but Ellegria has pulled him out of his funk. Barisone added that the AGDF has brought the first truly international dressage competition to North America, which he believes will put Americans on the fast track to catching up with the Europeans. “It takes a village to get this done. The Europeans just have a really big, organized village. I think that it takes the owners, and the riders, and everybody. It takes this kind of effort and this facility. It’s an incredible circuit. This [show] is going to be one of the things that propels us to being competitive with the Europeans. This is the village, right here,” Barisone concluded. Chris Hickey (USA) and Ronaldo finished first in the FEI Prix St. Georges presented by Wellington Equestrian Realty on a score of 71.842%, followed by second place finishers Denielle Gallageher-Legrif (CAN) and Argo Conti Tyme with a score of 69.781%. Third place went to Shannon Dueck (CAN), who scored 69.561% aboard Cantaris. Besides a few bobbles in the canter zig-zag and trot, Hickey was thrilled to see the eight-year-old Danish Warmblood gelding continue to flourish as the AGDF circuit comes to a close. Hickey was especially happy that Ronaldo’s owner, Cecelia Stewart, was able to attend the show, and even happier that she was able to see Ronaldo do so well. On top of that, the pair bested a field of 36 riders, making the win especially meaningful for Hickey. Ronaldo has been schooling all of the grand prix movements, but Hickey described him as far from ready to be competing at that level. He’ll continue at the small tour with Ronaldo to gain strength and confidence to develop the young horse’s talent. Hickey pointed out that Ronaldo shares a Don Schufro connection on his mother’s side with Paragon, Heather Blitz’s grand prix mount, and Hickey has noticed similarities between the two. “He’s a big, gangly, young horse still in his body. He’s not a short, smaller, really well-muscled horse. He is also [related to] Don Schufro, which is what Paragon is. If you look at him as a young horse, he was always skinny looking. Ronaldo has a long way to get strong and develop at the grand prix before he can get out and do it,” Hickey explained. Pedigree is important to Hickey, but he believes choosing a favorable bloodline is not based on talent alone. Ronaldo has also inherited his sire, Blu Hors Romanov, and dam sire Don Schufro’s remarkable temperament. “For an FEI horse, being a fancy mover as a young horse is not what I want. I want a horse that is going to take the work and develop and get stronger and have the gaits become more expressive and flamboyant as the horse is trained. This horse has a super temperament and a super character and a willingness to work. He goes to work and does his job every day. To me, that’s also a huge piece of what the breeding is,” Hickey explained. Hickey is excited to see what the future holds for Ronaldo, whom he believes possesses all the features of a great FEI competitor. The pair will contest the FEI Intemediaire-1 and the FEI Intermediaire Freestyle of the AGDF 12 CDI 3*. “Even though he’s expressive and flamboyant, his hind legs still do the right thing. He piaffes and passages at home unbelievably. You can fire him up and he’s amazing, and then you can fire him up and give him a long rein and he walks on the buckle, totally relaxed again,” Hickey concluded. The Adequan Global Dressage Festival (AGDF) is one of the world’s largest international and national dressage circuits featuring 8 FEI Dressage events, including a 5* and the only FEI Nations’ Cup Series CDIO in the Western Hemisphere. The AGDF offers more than $400,000 in prize money for the six international competitions, making it one of the richest circuits in the world. The Stadium at Palm Beach International Equestrian Center facility includes the Van Kampen covered arena (made possible by Kimberly and Frederic Boyer and family) and four outdoor arenas with world-class footing, 200 permanent stalls, and a VIP seating area for the International Arena fully catered for relaxing and having an enjoyable experience. 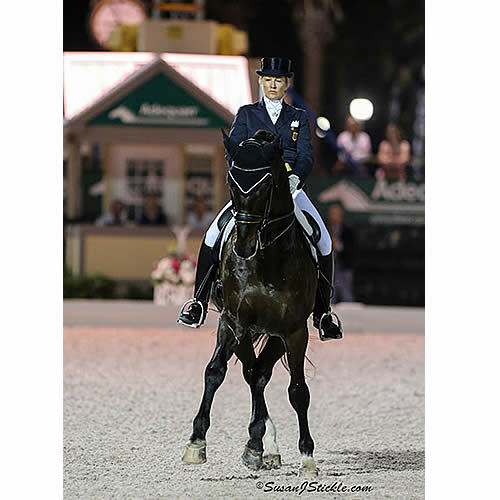 Wellington, Fla. – On Friday, U.S. riders again produced top finishes in Wellington, Fla. at the Adequan Global Dressage Festival CDI5* presented by Diamante Farms, as American combinations claimed victory in both the Grand Prix Freestyle and Grand Prix Special. Tina Konyot saved her best performance of the 12 week festival for last as she earned victory in the Freestyle competition, while her teammate from the winning U.S. Nations Cup effort one month ago, Adrienne Lyle, produced a an impressive effort to win the Grand Prix Special. Konyot (Palm City, Fla) teamed up with her 2010 Alltech FEI World Equestrian Games and 2012 Olympic Games veteran, Calecto V, earning the highest score of the evening to nearly break the 80% mark in front of a packed house. The 16-year-old Danish Warmblood stallion, who is known for strong performances in the Freestyle, did not disappoint as he earned a mark of 79.250% under the lights. With their winning performance on Friday Konyot and Calecto V close out their winter season on a high note after having earned numerous strong finishes over the last three months. Shelley Francis (Loxahatchee, Fla.) and Patricia Stempel’s Doktor, an 11-year-old Oldenburg gelding, were the second highest placed U.S. finishers in the Freestyle finishing in fourth on a score of 76.100%. Finishing the Freestyle in second and third were Danish combinations Mikala Gundersen with My Lady and Lars Petersen on Marrietta with scores of 76.775% and 76.625%, respectively. For the second consecutive day, Lyle (Ketchum, ID) and Parry and Peggy Thomas’ 16-year-old Oldenburg gelding Wizard earned high marks to claim back-to-back victories on the final weekend of the Adequan Global Dressage Festival. On Thursday, the 2012 Olympic veterans topped an international field in the Grand Prix and returned to The Stadium Friday afternoon to earn a score of 75.558% in the FEI Grand Prix Special Test and win the class by more than a six-point margin. Finishing in second place was Michael Barisone (Long Valley, N.J.) and Lauren Sprieser’s 13-year-old Westfallen mare Ellegria on a score of 69.392%. 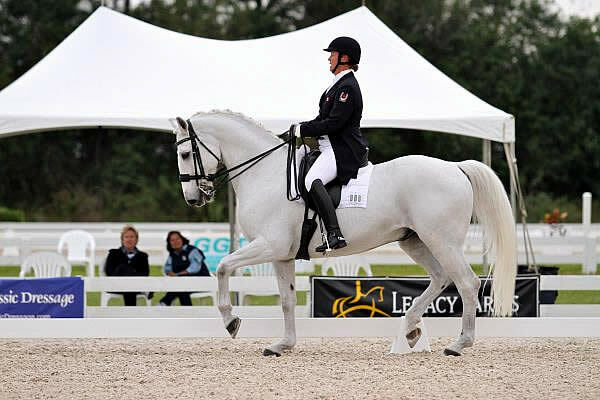 Learn more about the Adequan Global Dressage Festival here: http://www.globaldressagefestival.com/. Wellington, Fla. – The Wellington Nations Cup CDIO3* sponsored by Stillpoint Farm, held in conjunction with the Adequan Global Dressage Festival, came to a conclusion on Friday evening in front of a packed house with riders vying for Individual medals in Freestyle competition. Small Tour and Big Tour combinations went head-to-head, with the Ground Jury of Anne Gribbons, Gabriel Armando, Cesar Torrente, Lorraine MacDonald, and Bo Jena judging all competitors to determine Individual honors. The U.S. had strong representation in the Grand Prix with four of the six entries flying the American flag, while in the Small Tour two up-and-coming combinations represented the United States. For the third consecutive day Adrienne Lyle and Wizard could not be beaten as they posted a score of 75.8% in the Grand Prix Freestyle to earn the Gold medal. The competition for the top spots on Friday were incredibly close with the top three all finishing within one point of each other. Lyle’s teammate from the winning USA I Nations Cup team, Tina Konyot, joined her on the podium, finishing in third place. Splitting the American podium finishes was Juan Matute Jr. of Spain with Don Diego Ymas in the Intermediaire I Freestyle Test on a score of 75.325%. Lyle (Ketchum, Idaho) and Peggy Thomas’ 15-year-old Oldenburg gelding had the crowd’s full attention throughout their performance set to some of the most popular music from the 1970s. Throughout the test, Wizard’s ground covering and expressive gaits were on display and the maturity the impressive gelding has developed over the past 12 months shown through as he remained rideable during the entirety of the test. The pair showed brilliant work on Friday night, particularly in their rhythmic piaffe and, passage as well as introducing added difficulty by completing double pirouettes. The pair looked on track to score in the high 70s until a bobble in the one-time changes and stumble during their final extended trot. Lyle always enjoys riding her Freestyle and believes Wizard rises to the occasion as the crowd gets involved with the music. Finishing in third place on 75.2%, Konyot (Palm City, Fla.) and her own 16-year-old Danish Warmblood stallion proved why they have been among the top U.S. Grand Prix combinations for the last four years with another solid performance on Friday night. Riding to their trademark music which includes KT Tunstall’s “Black Horse and the Cherry Tree” and Beyonce’s “Crazy in Love” they added levels of difficulty throughout the test as they executed one time changes on a half circle as well extended canter into piaffe and piaffe pirouettes. Shelly Francis (Loxahatchee, Fla.) and Patricia Stempl’s Doktor produced a solid effort on Friday night in the FEI Grand Prix Freestyle to score 73.4% and finish in fourth place. The 11-year-old Oldenburg gelding has continued to improve in his second year at the Grand Prix level and in their test set to an upbeat soundtrack showed immense potential for the future. Leading off the Grand Prix Freestyle on Friday was Catherine Haddad-Staller (Califon, N.J.) and her own Mane Stream Hotmail. The 12-year-old Oldenburg gelding demonstrated solid piaffe and passage to score 69.8% and finish in eighth place for their up-tempo test. Silva Martin (Unionville, Pa.) closed out her debut U.S. Nations Cup performance with a ninth place finish in Friday’s Freestyle, riding the Rosa Cha W Syndicate’s Rosa Cha W to a score of 69.325% in the Intermediaire I Freestyle. The 10-year-old Warmblood mare showcased athletic trot work, with Martin increasing the technicality of the canter work to include flying changes on a circle, two-time changes, and solid pirouettes. Martin and Rosa Cha were awarded a 69.325% for their test that was set to current Top-40 hits. Shawna Harding (Aiken, S.C.) led-off the U.S. effort on Friday evening performing an up-tempo Intermediaire I Freestyle with Tonya Rowe’s Rigo. The pair executed a near flawless test to a compellation of hits from the 1970s which featured an enhanced level of difficulty including the 13-year-old Hanoverian gelding performing two-time changes on the centerline. They finished the Freestyle in 11th place with a score of 68.7%. Watch the Wellington Nations Cup CDIO3* sponsored by Stillpoint Farm live and find Video-on-Demand on USEFNetwork.com presented by SmartPak here: http://www.usefnetwork.com/featured/2014AGDF/. To learn more about the Adequan Global Dressage Festival, visit: http://www.globaldressagefestival.com/. Follow the U.S. Dressage Team here: http://www.usefnetwork.com/featured/USDressageTeam/. Adrienne Lyle and Wizard. Photos © SusanJStickle.com. Wellington, FL – February 21, 2014 – Individual medals for the Stillpoint Farm CDIO Nations Cup were presented following the FEI I-1 Freestyle and FEI Grand Prix Freestyle competition, part of the week’s featured “Friday Night Stars” event. Both freestyles were judged as one class to crown the individual champions of the Stillpoint Farm CDIO Nations Cup at the Adequan Global Dressage Festival (AGDF). Earlier in the day, riders from Canada took the top three places in the FEI Grand Prix CDI 3* presented by Peacock Ridge. The top three in the CDIO competition all scored within one percent of each other, with Adrienne Lyle and Wizard taking the top podium position for their score of 75.800%. Matute Jr. wasn’t far behind with Don Diego Ymas; the pair scored a 75.325%. Tina Konyot and Calecto V finished with a 75.200%. Watch Adrienne Lyle and Wizard perform their winning freestyle test! Video courtesy of Campfield Videos. Tuny Page of Stillpoint Farm was extremely pleased with how the class played out, using the format tested for next year’s Pan American Games for both the team and individual competition. The format may have been unusual, but Page believed it brought out the best in the sport. “It is an unusual situation to have I-1 and grand prix compete against each other, but in this instance I honestly think the cream rose to the top. My sense of it is that the judges are really satisfied with the results that they got,” Page commented. Page was also very happy with the turn out of the crowd and their enthusiasm for the sport. “It’s a really great synergy between the riders and the audience. These three riders elicited a huge response from the audience, and that speaks to the truth of what they had: tremendous harmony and huge risk – risk that they pulled off, so I say bravo!” Page remarked. While sponsoring the entire circuit has been incredibly rewarding for Allyn Mann of Adequan, the Stillpoint Farm CDIO Nations Cup competition was in a league of its own. “The element of the Nations Cup just takes it to another level. I think of Robert Dover and his vision for us going down the road. The excitement of the competition for the individuals and for the teams. We are just thrilled to be a part of it, and I am just so overwhelmed by the gratitude that people have shown us for being just a little piece of the puzzle. I think it takes a community of people to make this work, and I’m just so humbled to be a part of it,” Mann commented. Having two American riders medal individually on the heels of a USA victory during team competition was the perfect ending for United States Dressage Chef d’Equipe Robert Dover. It’s been some time since Lyle and Wizard have attempted the FEI Grand Prix Freestyle, but it was plain to see during their performance that both rider and horse were more than happy to be riding their test. Lyle also expressed her gratitude to the Thomas family, her long-time supporters and owners of Wizard. “Thank you to the Thomas family. They’ve been my sponsors for nine years, eight years with Wizard. If it wasn’t for them, I wouldn’t have any of the chances that I have had in my career. They have been incredible,” Lyle expressed. Matute Jr., who competed at the FEI Intermediaire-1 level, did not dwell on the fact that he was going up against riders capable of more complicated movements, instead focusing on the great feeling he got out of Don Diego Ymas. See Juan Matute, Jr. and Don Diego Ymas perform their freestyle! Video courtesy of Campfield Videos. “Grand prix has a lot of harder movements, a little more risk. Overall harder to ride, a harder tour. I was super pleased with my score. The ride was phenomenal. I think I got pretty much all out of Don Diego. It was fantastic. I couldn’t ask for anything more. No complaints!” Matute Jr. grinned. Friday evening’s class was only the third freestyle Don Diego Ymas and Matute Jr. have performed and the first time either had ever competed under the lights. Despite some initial nerves, Matute Jr. agreed that the increased atmosphere was a lot of fun for both of them. “He actually likes it. I think he likes the people watching him and the pressure of everyone watching. I think we both like it actually,” Matute Jr. explained. Konyot admitted that she and Calecto V can have trouble accepting anything but first place, but she was very pleased to see her younger counterparts on the podium on Friday. The evening’s atmosphere was electric thanks to packed stands and a black tie dress code for the Global Pavilion. A South Florida native, Konyot was especially excited to see the surrounding community flocking to The Stadium. “When we drove in here this evening to see all the people and excitement, all revolving around dressage, here in South Florida where I was born and raised. It’s just an amazing feeling,” Konyot remarked. Matute Jr. concluded the evening by honoring his father, Juan Matute Sr., whom he credited with his success. After a touching speech expressing his gratitude, he removed his silver medal to place it around his father’s neck. Earlier on Friday, Canadian riders swept the FEI Grand Prix CDI 3* presented by Peacock Ridge, with Karin Pavicic winning the class aboard Don Daiquiri. Don Daiquiri, a 12-year-old Oldenburg gelding owned by Jayne Essig, and Pavicic earned a top score of 69.440%. Second place finishers Tom Dvorak and Viviva’s Salieri W finished on a score of 68.620%. The top three was rounded out by Jacqueline Brooks and D Niro; the pair finished in third place with a 67.120%. For her win, Pavicic was also awarded the Champion Equine Insurance Dressage Style Award, presented by Laura Fetterman. Pavicic has ridden Don Daiquiri for owner Essig for the last six years. Essig bought him as a five-year-old and handed him over to Pavicic upon realizing he needed the touch of a professional. Despite being a little bit tired going into the test, Pavicic thought Don Daiquiri still performed beautifully in the ring. “I was really happy with my horse today. He was a little bit tired when I brought him out, but overall super rideable and relaxed. My goal was to be mistake-free, and I accomplished that for the most part. I’m really happy about that,” Pavicic detailed. Second place finisher Dvorak, of Ontario, was also thrilled with his horse, describing Friday’s test as a “breakthrough day” for Viva’s Salieri W.
“Today was a breakthrough day because up until now, he always had a lot of tension in the ring and that tension always went a little bit against me and not for me. Today, he had so much energy and he was so rideable and so true. There was so much there for the taking; I didn’t even know what to do with it when I was in there,” Dvorak smiled. Viva’s Salieri W has only seriously campaigned the grand prix level since last fall, after taking Dvorak to team silver for Canada in the 2012 Pan American Games. An injury early on in his grand prix transition sidelined the gelding, but now that he’s healthy and back in the grand prix ring, Dvorak says he hasn’t looked back. Dvorak and Pavicic were exceptionally pleased to have Canada take the top three spots in the class. Both riders have their sights set on the Alltech FEI World Equestrian Games in Normandy. Following the AGDF, Dvorak and Pavicic will continue to contest various CDIs on the way to qualifying for Team Canada. The FEI Intermediaire B 16-25, sponsored by Diamante Farms, wrapped up after the FEI Grand Prix CDI 3*. Melanie Montagano (USA) and Ga Deva topped the class with a score of 57.548%. 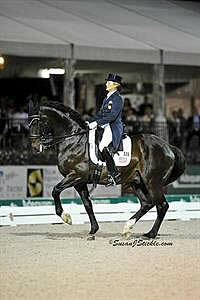 Tina Konyot and Calecto V at the 2013 World Dressage Masters CDI5* Palm Beach. Photo © SusanJStickle.com. 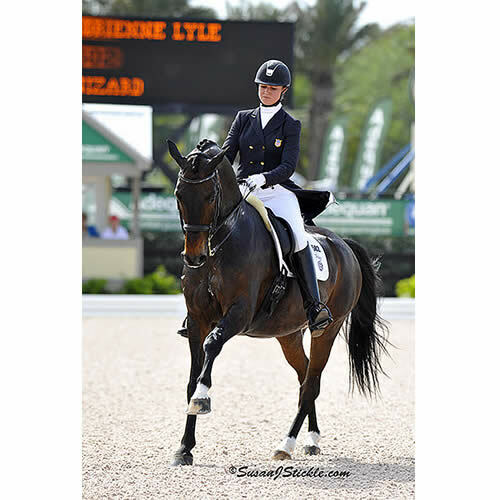 Loxahatchee, FL – March 19, 2013 – Tina Konyot and Calecto V have competed lightly but successfully in South Florida this winter, and now their bid to compete in the Reem Acra FEI World Cup Final rests on their performance in the March 21-24 International Horse Sport Champions Cup CDI-W. The IHS Champions Cup, held at the IHS Champions Park at Equestrian Estates in Loxahatchee, is the final World Cup qualifier for the North American League. Horse and rider combinations must post two scores in designated World Cup qualifying events to be eligible to compete. The two highest-scoring combinations earn a place at the Final, which is slated for April 25-28 in Gothenburg, Sweden. Konyot and Calecto V earned their first qualifying score in the Feb. 14-17 Florida Dressage Classic CDI-W, part of the Adequan Global Dressage Festival. They were awarded 76.775% for their Grand Prix Freestyle performance, the highest North American League score recorded to date on the road to qualification for the 2013 World Cup. After the most recent World Cup qualifier, the Feb. 28 – March 3 Palm Beach Dressage Derby CDI-W, Canadian duo David Marcus and Chrevi’s Capital stood atop the leaderboard for the North American League with an average of 73.975% for their top two qualifying Grand Prix Freestyle scores. Fellow Canadians Jacqueline Brooks and D Niro were in second with an average of 72.600%. To obtain the required second qualifying score and secure a spot in the World Cup Final, Konyot must compete in the IHS Champions Cup and post a score high enough to overtake Brooks in the standings. With two Canadians currently holding the top places, Konyot and Calecto V represent the last U.S. hopes for the World Cup Final. The International Horse Sport competitions have proven to be essential stops for riders hoping to qualify for the World Cup Final. Several riders put themselves on the leaderboard with strong results at the historic Palm Beach Dressage Derby. Jaimey Irwin and Lindor’s Finest took third and Diane Creech and Devon L claimed fourth after both pairs earned their second-highest qualifying scores of the season at the Dressage Derby. Brooks also collected a key score there on her way to her current second-place standing. Brooks, Creech and Marcus all plan to return to Equestrian Estates for what is shaping up to be a competitive Grand Prix division. Along with his potential World Cup mount, Chrevi’s Capital, Marcus will ride Don Kontes, with whom he finished third in the Grand Prix at the Dressage Derby. The Grand Prix also features several competitors who have been successful on the winter circuit thus far, including Lars Petersen and Mariett, winners of the Grand Prix and Freestyle at the Dressage Derby, and Shelly Francis and Doktor, who were second in both classes. If Konyot and Calecto V deliver the performance Konyot is hoping for, spectators at the Champions Cup will have quite the show as she goes head-to-head with other top competitors and tries to earn her remaining qualifying score. The Champions Cup will be held at IHS Champions Park, also known as the Derby Showgrounds, a beautiful property in White Fences owned by Mary Ann and Walter McPhail and managed by International Horse Sport Palm Beach. The IHS Palm Beach Managing Partners include FEI riders and trainers Ed Borresen and Lars Petersen, together with well-known show organizers Noreen O’Sullivan and John Flanagan. To learn more about International Horse Sport and the IHS Champions Cup CDI-W, go to www.ihspb.com. For class schedules, results and information about International Horse Sport Palm Beach, go to www.ihspb.com. Tina Konyot and Calecto V. Photo © SusanJStickle.com. 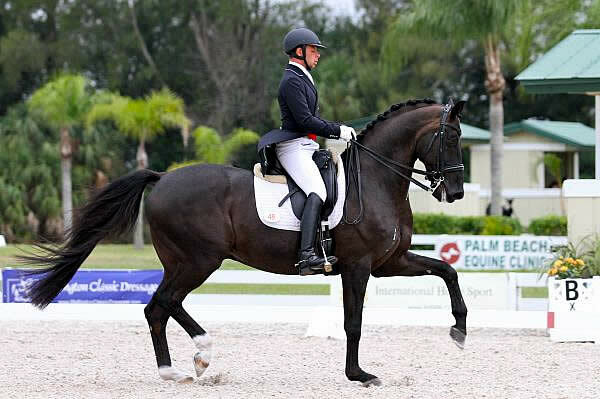 Wellington, FL – March 14, 2013 – The third international competition for the 2013 Adequan Global Dressage Festival (AGDF) began today with the opening CDI competition, the FEI Grand Prix. This week’s show, the WEF Dressage Classic CDI 3*, presented by Today’s Equestrian & Fellows, runs March 14-17, 2013. Today’s winner was Tina Konyot from Palm City, FL, riding Calecto V.
There were 55 entries that jogged for the CDI competition this morning, with Carlos Munoz taking home the prize for Best Turnout Award from Show Chic with Klouseau. The judges for today’s FEI Grand Prix were: Anne Gribbons at E, Janet Foy at H, Isabelle Judet at C, Ulrike Nivelle at M, and Bo Ahman at B.
Konyot and Calecto V, winners of the FEI Grand Prix Freestyle at the last CDI-W competition at the AGDF, won today’s FEI Grand Prix with a score of 70.553%. Cesar Parra (USA) and Van the Man placed second with a score of 68.213%. Susan Dutta (USA) placed third with Currency DC on a score of 67.383%. Konyot traveled from Palm City to Wellington this morning in order to compete, and felt that the early morning wake-up call may have had an effect on Calecto V, her and John Byrialsen’s 15-year-old Danish Warmblood stallion (Come Back II x Rastell). In addition to their class win, Konyot and Calecto were presented with the Champion Equine Insurance Dressage Style of Riding Award presented by Laura Whitlow of Champion Equine Insurance. In the national divisions, Megan Glynn had a one-two finish in the FEI Prix St. Georges – AA class with Tyto (62.303%) and Everybody’s Darling (61.908%). The high score of the day was Alix Szepesi on Primative Dancer, who did the First Level Test 2 in the USEF Test of Choice and received a 74.189%. The Para-Equestrian competition begins tomorrow in the Van Kampen Covered Arena, along with a full schedule of competition in the National divisions in the Wellington Equestrian Realty Rings 1 and 2. The Para-Equestrian riders will compete tomorrow in five grades for their team scores. Their individual tests will run on Saturday, and the team and individual scores combined will determine the team placings. On Sunday, they will have their freestyle classes. Come see top United States para-equestrians such as Mary Jordan on her homebred mare Clever, along with Sebastian, with whom she placed fifth in qualifications for the London Paralympic Team. The Canadians have brought a strong contingent as well, including three out of four of their team from last summer’s Paralympic Games. Don’t miss tomorrow night’s exciting line-up of events at the AGDF, including the $10,000 Head-to-Head Competition over the high jump “Puissance” wall at 6 pm, the FEI Grand Prix Freestyle presented by Horseware Ireland under the lights at 7:30 pm, and The Yale Spizzwinks (?) A Capella singing performances. General admission and parking are free, and there will be fantastic raffle prizes handed out to general admission seat holders. It will be a night of power and grace for equestrian sport that you won’t want to miss! The Adequan Global Dressage Festival (GDF) is one of the world’s largest international and national dressage circuits featuring five CDIs, including a 5*, the first non-championship CDIO Nations’ Cup in the Western Hemisphere, and nine U.S. national events. The Adequan GDF is offering more than $275,000 in prize money for the five international competitions making it one of the richest circuits in the world. In addition to the CDIs with national competitions, the Adequan GDF will feature six separate national shows to be held at the Stadium section of the Palm Beach International Equestrian Center (PBIEC) show grounds. The Adequan GDF encompasses almost 60 acres of the former Palm Beach Polo Grounds. The facility includes the Van Kampen covered arena (made possible by Kimberly and Frederic Boyer and family) and four outdoor arenas with world class footing, 200 permanent stalls, and a VIP seating area for the International Arena fully catered for relaxing and having an enjoyable experience.